PUBLISHED JANUARY 2012 • It can be ordered through our own online store. Or any good local bookstore using the ISBN below. PRESS INFO see bottom of page. The answer is that you might well have done. For just as popular music seems to rifle the albums and bands of earlier generations, so the designers also often lean on the past for inspiration. Sometimes this is done by way of a deliberate reference point. In other cases the band might be wanting to pay homage to their influences, or maybe they’ve just seen a cover idea which they like so much they want to borrow it. On other occasions the similarities are less well intended, designed to mimic or even poke fun at designs and bands. Sometimes the new covers are simply a deliberate spoof of a well-know piece of artwork, done for subversive or mischievous reasons. So you get Ian Gillan of Deep Purple, just kicked out of the group, referencing one of his former band’s classic covers, but blurring away the rest of the group on purpose. Or comedian Barry Humphries commissioning a very clever pastiche of the very familiar Sound Of Music cover painting, only with himself in a frock dancing up the hill instead of Julie Andrews. Paul Weller’s band The Jam did an album called Sound Affects, and wanted a cover which recalled the pioneering series of BBC Radio sound effects albums of the 60s and 70s, a knowing design which only older fans would have even been aware of. The list goes on. For this fascinating book, collector Jan Bellekens has scoured the second hand stores and record fairs of Europe and assembled an amazing collection, or which this book contains a selection of over 650 sleeves. The original covers are shown alongside their newer cousins, with explanatory notes for music fans and designers. UPDATE Dec 2010 • Jan, the author of this book, suffered a lightning strike to his home recently which knocked out all his electrical appliances, including computer. He has got himself sorted out but has had to spend time bringing all the various elements of the book together again from his back-up discs (thank goodness he had a back-up regime is all I can say!). For this reason, we had put the title back. You can read about the fun and games with our attempts to access his hard drive here. I have to say, even as someone who has spent many hours over forty years going through record shop racks, the sheer content of this book has amazed me. Choosing what to include is sometimes difficult as Jan has assembled so much material. Read about how the cover for the book was designed and developed here. Read what Word magazine (RIP) had to say about the book here. You can see some of the other press coverage of the book here. Sample pages from the book. Please note these are subject to change and revision. Click on any image and they can be viewed at a larger size in a gallery. Sample pages with cover, and a 3 page colour sales sheet are also available as PDFs, see below. 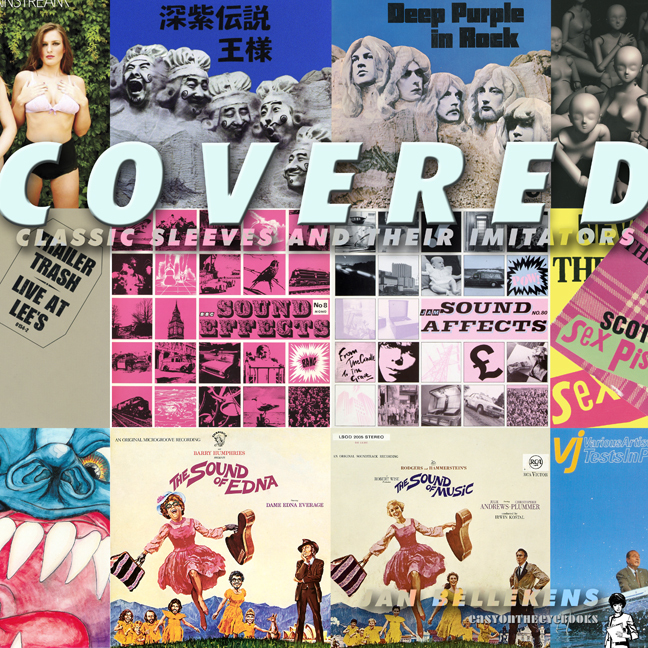 Free downloadable Covered screensaver with 40 of the best sleeves on! We also have low res PDF versions of the entire book which can be supplied to bona fide magazine editors to help plan any articles from. Full resolution versions of the sleeves can be supplied for the same purpose.